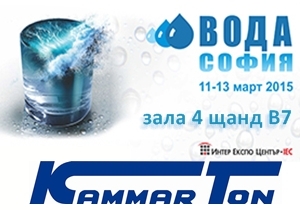 "Kammarton Bulgaria" will participate with a booth: B7 in Hall 4, Inter Expo Center - Sofia at the ninth International Business Forum WATER SOFIA, which will be held from 11 to 13 March 2015. Our participation was inspired by the opportunity to focus on the innovations in the products to our business partners – world leading companies. 11/12 of March - 10:00 to 18:00 h.
March 13 - 10:00 to 17:00 h.
WATER SOFIA is the only business exhibition in national water sector and is the largest in Southeast Europe. Over the years the exhibition has been established as a forum for demonstration of achievements and exchange of experience between Bulgarian and foreign companies. The main objective of the event is to accelerate the implementation of innovative and progressive solutions in water resource management.